Seattle and Tacoma's jointly operated marine-cargo facilities directly employed 20,100 people in 2017, with marine-cargo related jobs paying wages and benefits averaging nearly $95,000. Across the state, this activity supported 58,400 jobs. Even as Seattle becomes more tech centric, it must continue supporting its maritime sector, which provides tens of thousands of jobs and economic opportunity across the state. The sector will get a boost from massive investments coming to the city’s harbor. Under plans that should be approved on Feb. 26, the Northwest Seaport Alliance will spend around $340 million upgrading Terminal 5 at the base of West Seattle. King County taxpayers should take note as they’re supporting this with higher port taxes. The levy increases from about $69 in 2018 to $70 on a $570,000 house this year, rising to $79 in 2023. A Northwest Seaport Alliance economic study explains why it is worthwhile. Seattle and Tacoma’s jointly operated marine-cargo facilities directly employed 20,100 people in 2017, with marine-cargo related jobs paying wages and benefits averaging nearly $95,000. Across the state, this activity supported 58,400 jobs. That year, there were 1,950 vessel calls. More than 80 percent of the containerized cargo went to or from Asia, where trade will continue despite the current tariff disputes seeking to address China’s unfair business practices. Terminal 5 is a special asset. With deep water and rail service onto the dock, so containers can transfer directly to ships, Terminal 5 should be one of the top cargo facilities on the West Coast. But it’s been largely dormant since 2014, when container activity was consolidated at nearby terminals as the shipping industry contracted. 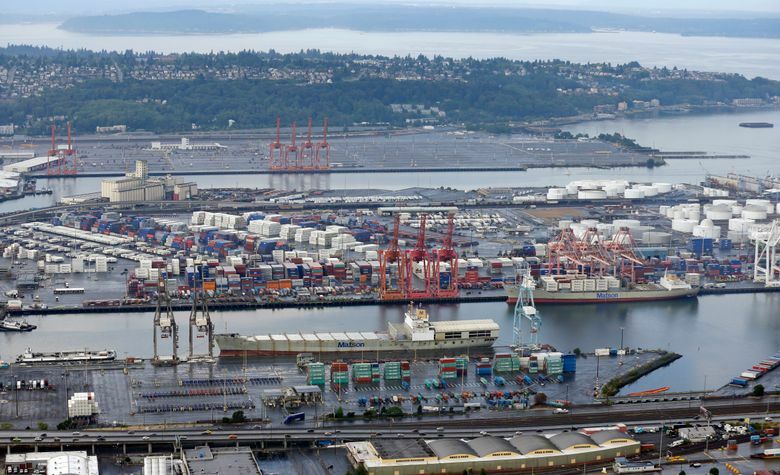 Since then, the ports of Seattle and Tacoma formed the alliance to jointly operate marine-cargo facilities and upgraded Tacoma’s port with new cranes to handle the latest jumbo container ships. Now, the shipping industry is stronger, environmental reviews are complete and a tenant is ready to lease Terminal 5 for at least 32 years. The tenant is a consortium including Seattle-based Stevedoring Services of America Terminals, Terminal International Limited and several shipping companies. They’re expected to spend up to $255 million on new paving, yard-handling equipment and new cranes needed for jumbo ships, starting with around $135 million in the first phase of upgrades. Publicly funded work includes berth deepening, utility upgrades and strengthening docks. “It’s the strategic investment in the best terminal,” Seattle Port Commission President Stephanie Bowman said. Upgrades should be complete in 2021, two years later than the port’s original goal of 2019. Better late than never. This will restore Terminal 5 to its highest and best use as a world-class cargo facility, extend Seattle’s maritime heritage and reaffirm its role as the portal to the Pacific.